To prevent Osmosis (or the movement of water or water vapor through a wall) a foundation wall has to be protected with an exterior coating. This starts with a very well mixed concrete. To consolidate the reinforcement of the wall, a structure that has little to no shrinkage is the best starting point. Since there is no shrinkage, there is less likely to be any cracks leading to leaks. This can be done by following a strict low water- high cement concentration mix. Usual concrete waterproofing methods include coating the positive side or exterior of the wall with material that prevents water from leaking through. This is just one of the options available. Another way to effectively protect your exterior wall is to make the concrete you use impervious to any water damage or accumulation of water vapor leading to leaks. To do this, start with a thoroughly cleaned, smooth surface on your wall. This is the best way to prepare the wall for waterproofing or damp proofing. Simply wash off loose particles on the wall. For more stubborn elements on your wall, use a light brush. Remove anything that slightly protrudes and finally, cover up any existing cracks. Use seam tape for bridge cracks if you have to. If you’re working with freshly laid concrete, allow it to cure completely for at least 2 weeks. We’ve mentioned damp proofing. What is damp proofing? This is the term used when you spray on asphaltic material or apply it with a brush/ roller on your wall. This is a very simple treatment that can easily be done by builders. But, if you really want to have a high level of certainty, get a specialty waterproofing contractor. That’s very important especially if you have larger projects. But, if you really want to go into the real act of thorough waterproofing, just remember that it’s going to take a lot of time and effort to complete. Not to mention the fact that it’s going to be expensive. There are several ways to go about it. One is covering the entire exterior surface of the wall with impermeable coating. That covers every inch of your wall from top to bottom, even extending down to the drain. Another method entails the use of adequately lapped sheets fastened to the exterior wall. Lastly, there’s also a method that simply requires you to spray on the material to your wall until you cover the entire wall with the product adequately or according to the manufacturer’s specifications. If you’re going with the spray-on treatments, know that you need to prime your wall before applying the product itself. After priming your wall and applying the product, you’ll also have to apply one or more layers of a liquid-rubber, elastomeric coating to serve as the final protective coating on your wall. This helps make your wall seamless and resistant to punctures. 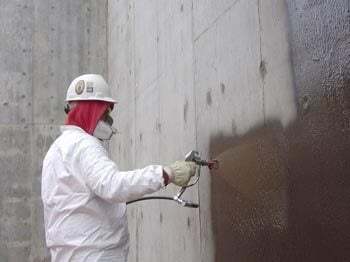 This process usually takes an hour to complete and a minimum coat thickness of 60 millimeters is usually the expected thickness all throughout the entirety of the wall. The application of sheet products, as mentioned above, is also another good way to waterproof the exterior of your wall. These are usually rubberized asphaltic membranes attached to polyethylene film. These are then directly fastened to the wall to provide the desired protective results. This is done either through the peel-and-stick method or with through using separate mastic. Doing the latter may entail the use of fasteners to further augment the strength of the product’s ability to stick. There should be enough overlap at the seams. Usually, 2 to 3 inches is enough. Just be careful and make sure you do not create any “fish mouths” or gaps at the edges with your seams. Application of these sheets is relatively easy as all you need is to cut with a razor and press the material down to seal. For areas with bubbles or air pockets, you can remedy this by slitting the membrane, pressing down and applying another membrane patch right over the affected area. It’s a very simple process. The International Residential Code has set a standard practice for the application of this membrane stating that the membrane is required to extend from the top of the footing to the finished grade. A slightly better approach is to fully extend the membrane over the footing and further down into the drain trench. 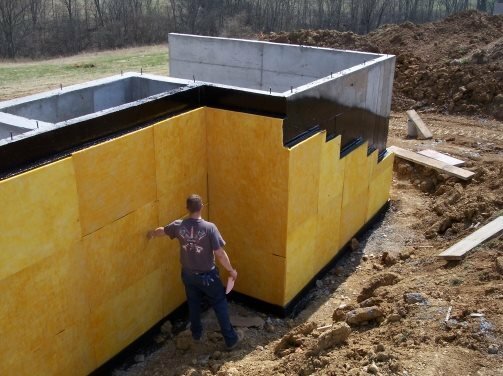 Concrete protection contractors may also use bentonite waterproofing panels if the foundation they have to work with is very wet. These panels are a combination of bentonite clay and cardboard mixed evenly. When water hits the bentonite clay, it expands and forms an effective barrier that shuts out water completely. Another highly effective method for waterproofing concrete walls is to integrate the waterproofing system within the concrete itself. This is done through various concrete waterproofing products – contact us at GSG for more information. This material can be overlaid on top of the concrete wall. What it does is react to water by crystallizing. When this crystallization effect takes place, the material grows dense and effectively shuts out any moisture from seeping in. It is so effective that it has even been known to seal small cracks effectively. This method is quickly gaining popularity as it is a very easy and effective method to incorporate in your waterproofing techniques.